A shed that has seen better days and needs a new roof. 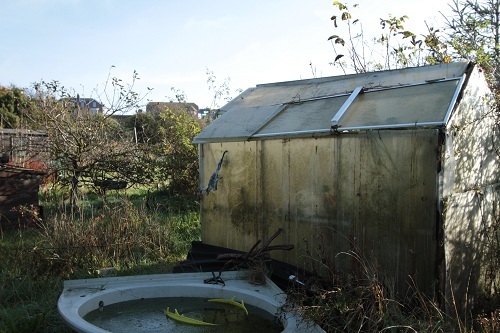 A homemade greenhouse that is in need of some major TLC and is totally overgrown inside….. but there is a Kiwi Fruit in there, somewhere…..
And this, yes, a bamboo on an allotment. Who thought it would be a good idea to plant a suckering bamboo on your plot, let alone the edge of it? No please don’t send your answers on a postcard! Not impressed or inspired? Look beyond it and start dreaming. I’ve taken on an extra plot with a friend from the allotments, and oh the plans we have! One day, when the clearing up has been done, the chopping down and digging up of the bloody bamboo of the Bloody Bamboo fame, emptying the bath water (but we need to check for wildlife first), cutting back and clearing up in the greenhouse, weeding, and pruning it will be perfect for fruit growing. So right now you have to imagine rows of raspberries, beds of strawberries, currants of every colour, blackberries, gooseberries, rhubarb, a few dwarf fruit trees like plum and apple, a tamed Kiwi Fruit, maybe a grapevine, and who knows even some melons in the greenhouse. You just need imagination right now. Spadeful’s of it. That, time, some muscle power and determination. Over the next year or so, here on the blog I’ll be able to show what we are up to and the changes that take place and hopefully the changes will include fruit pickings. And the joy that is a new plot is made even better with the fact that it neighbours my own plot, so a mere hop, (not even a hop, skip and jump) over the path and we are here! 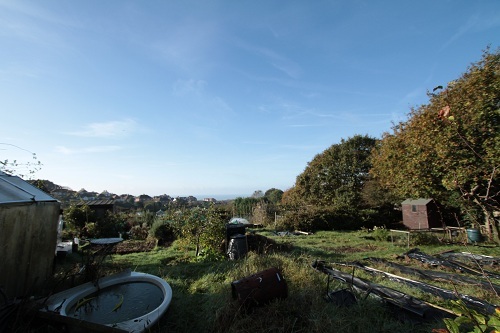 How about this last shot for a weekly view, aka the “View Club”, over the new plot and across the allotments and out to sea? Such an exciting new project Claire! And you have the imagination and plans to make it a success – I’ll be following the progress of your new plot with interest. 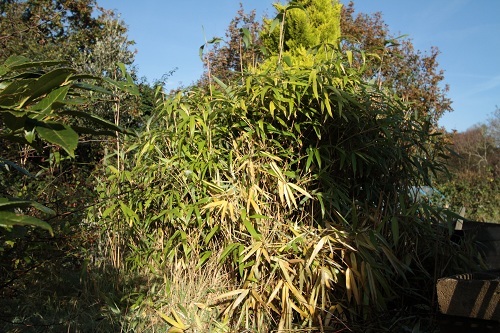 There was a big bamboo plant on the allotment I took on years ago – do you think they get planted to provide home-grown canes for beans? I’ve never heard of it before! We dug one out of our garden, it was the wrong kind/in the wrong place scenario and it was pretty tough to dig out. Maybe people do think of them as canes, but it’s nuts to me !! Thanks for the info Kathy, I’m embarassed to say I’ve never planted a tree, I really should make it a goal for next year. And armed with some extra info is a great way to start ! Potential is the perfect word, thank you ! That is great Claire! I think for you, the joy of having this new plot is for me like having an iPad 😉 hehehe!! I’m very happy for you, I know you’ll enjoy every second on it, including the hard work. You are going to work magic here… and we get to watch! I’m so happy for you and your friend! You are so inspiring. I have a yard …. but I’m so poor at gardening. I’ve tried the easiest (tomatoes) and failed (they split) . Maybe next year I should clear a patch of grass, and try a small garden. I love what you do. I must give this some serious thought. Keep trying and growing my friend! I’ve found tomatoes can be fussy – I think one of the reasons yours split was irregular watering, which apprently they hate! little and often is best – I know that can be tricky, but do give them another go, maybe cherry tomatoes would be good to try? Gardeners always have to use their imagination…I know with your determination that it will be very fruitful. Omigosh, Claire, you have quite a project ahead of you. Are you able to work through much of the winter or does the ground get too hard to work? I’ll be following your progress and cheering you on. It will take a lot of hard work to clear and organise it, but bit by bit, slowly slowly does it. I think it will take maybe 2 years to straighten it out properly, and get the fruit bushes well established. And thank you for your cheers, I do appreciate them ! Claire what an inspiring post! I can’t wait to watch the transformation as we move though the seasons with you! And the view to the sea is most be sublime. Thank you Deb, there are days when it’s blowy and windy and the view isn’t so good, but I do feel very lucky to be abl eto hav ethis little plot and have such great plans. I know I’ll enjoy transforming it! Ha, ha, farmer Claire, no let’s stop there, right now and right here. Your Shangri-La a is expanding! I look forward to the photos of the transformation!! Good luck Claire I have 3 plots and its very hard work but its worth it as you know. Thank you Gaynor, as you say hard work, but hopefully at some point in th enot too distant future I’ll be snacking on fresh fruit and as you say it will be worth the effort. The sorting of the bamboo i sgoing to be a tough job! This looks like a lot of work, but you seem to have the energy, the ambition, the ideas and – I’m happy to hear – a bit of help. Good luck! I’ll look forward to watching the progress. Do you think your nice blogging posts of the transformation, with your lovely photographs, might work themselves into a book someday? Thank you Cindy for your kind words and encouragement. Who knows where these things like blogs and photos will lead us? So far I know I love to write and photograph, and chat with my new found friends! Who would have thought it all possible a year or so ago?! Your new ideas are just so much fun! Every year…during the winter…I dream of my yards and gardens and can hardly wait to start! I am very happy for you to have such delightful HUGE allotments for digging in the dirt is…heaven! It may look somewhat bare but so many possibilites for the new planting season are ahead. I think fruit is a wonderful crop to grow, fabulous tasting, great value when you think of the returns, fab fresh, easy to can or freeze, oh yeah and to drink 🙂 We’ve just finsihed the last of the raspberries, I’ll miss them till next year! You better come in now … take a hot shower and put your feet up. Some work you have ahead of you – but I can see the weather is pretty great .. and it’s truly nice to be outdoors a chilly autumn day. Can’t wait to see the result of your hard work .. in the Spring. I love that train journey from Brighton to London. The landscape is so beutiful. But you must be on the Eastbourne train. Chatting with you now .. all memories comes back and I miss Brighton. Now thats imagination and determination! Good luck, it’s a lot of hard work. You have alot of energy and perseverance to change that garden. LOve that shed with the cute plaque. Looking forward to following you on your journey Claire. The before and after shots are sure to be spectacular! I do love your sitting spot though, in front of the shed. That’s the perfect spot for a weekly photo! 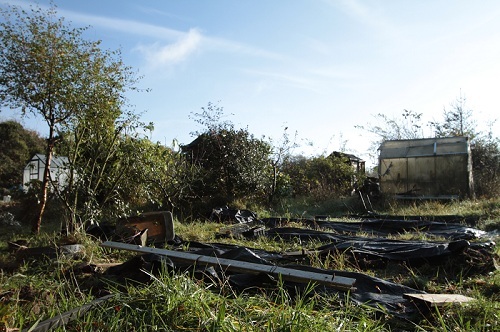 I can’t wait to see your new allotment dreams come to life! Wonderful! Sounds ambitious, fun and totally do-able from what I’ve seen here. You must be really energized by this piece of ground that you can transform. I’m a big believer that any tree that goes into the ground (more or less) should be fruit or nut bearing. 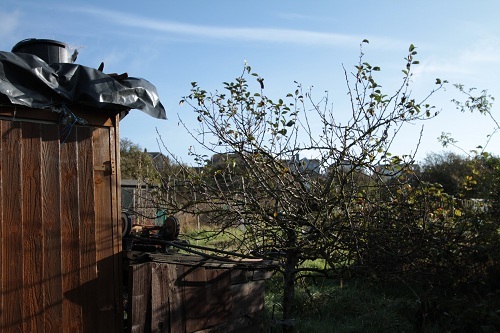 We just put in two plum trees this autumn, following quite a few other plantings over the past year and a bit. Can’t wait to see how you get on! I’d like to plant some nut trees, I nee dto do some research and find some good nurseries, that would be a lovely thing to plant ! I think I’ll be needing more tea and gingernut biscuits to help with the energy levels ! That’s a lovely idea Tandy, I’d also thought of using it as a carrot bed as well. I’ll need to be brave and explore it !! Wow, I am so envious of your new space. My mouth is watering at the thought of all those berries. Can’t wait to see what sprouts up ;). Thank you, I think it will soon fill up with blackberry, raspberry and currant bushes – well that’s what I’m hoping ! Late to the party, but I’ve got to tell you – that is one heapin’ pile of possibility, right there! It’ll be fun to watch it come back to (productive) life! And yes I just caught up with Cathy’s Tuesday at 2 – it’s going to be fun to watch the seasons across continents ! Ooh, this is all very exciting! It seems you are going to spend a little time tidying up but that forgotten lot looks amazingly stimulating to me! The view is striking and you can already count on some grown up trees and shrubs, structure is very important! I am really happy for you and will look forward to seeing the evolution of this great project! I can’t wait to hear what wonderful things you do with this! The thought of the fruit is amazing! Hi Inger, you know the more I’ve grown my own frut and veg the more I’ve really realised how good fruit is to grow – it seems that for less effort you get a lot of rewards, and fruit can often be very expensive and not particuarly tasty! Feel free to dream along with me Spree ! 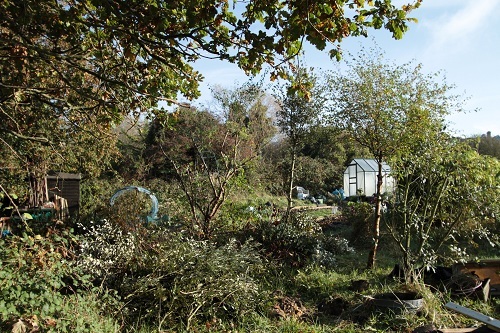 I so admire allotment gardens so going above and beyond to clear the junk away before you even can start is laudable. Keep up the good work. Been quietly subscribing for several months but had to comment on this effort. It’s remarkable what is left on some plots, to be honest this isn’t too bad, mostly overgrown. I had to dig up a carpet on my original plot, it had been down so long the weeds had grown through it, and then we had to dump it. Now that was HARD work !! I adore your little hut/shack/garden buildings. I have never met a shed I did not like. By there very nature they are just special. Good luck on your expansion…oh the fun foods you will grow. Can’t wait to see what happens come spring. 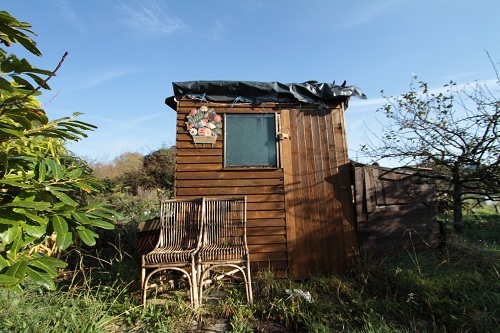 I love sheds too Teresa, everyone is different and on allotments they are often homemade or very patched up so are bursting with character! If only the walls could talk and tell us some gardening tales ! Hi Stacey, I know you have the vision, in fact I could do with some of it here, oh and some ‘elbow grease’ as we say! I know how much you have achieved with your garden, and I know how much effort that must have taken, and like you I realise it’s not going to happen overnight – unlike those make-over programmes on TV !!! The more I garden the more I realise how wonderful fruit is, so tasty, and a great return on your efforts! I’d love to see a monthly view from your beautiful garden, and I’m sure others would too ! Exciting times!! What an excellent idea to grow fruit on the second plot. That way you can continue to concentrate on the veggies on the other. Can we have photos of the contents of “the shed”? Live to see what it contains. If you suddenly see page iews from Tanzania it will be me…I’m on the lodge’s wifi! Oh the glamour of using wifi from Tanzania !! Are you on your way home? I just looked at the stats, and sadly you are not my fist visitor from Tanzania, now if you could obligingly go to Greenland that would be perfect !